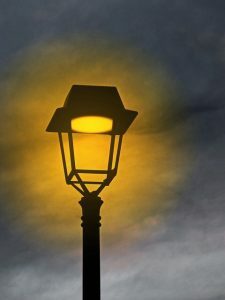 The Parish Council has entered into a contract with Eon Energy Solutions Ltd to refurbish the street lights it is responsible for within the parish, some 30 or so. This involves the replacement of existing SOX lanterns with dimming LED lanterns and the replacement of many of our deteriorated and contaminated pole fixings, including the replacement of 3 concrete columns with steel poles. This is a significant investment by the Parish Council, costing in the region of £20,000 but is necessary to bring your lighting up to the required standard. In future savings in maintenance and repair costs are expected whilst less energy consumption will be achieved. Because much of the work involves Eon working with Scottish Power our energy provider, the work is not expected to commence until December 2018 and is expected to continue into the new year. As a result some street lights which fail in the interim will not be repaired, as this would not be cost effective. Should you require further information please don’t hesitate to contact the Parish Clerk.